Are you looking for professional, reliable EFT Training? This course will cover the new training material and requirements for becoming a recognised EFT practitioner. 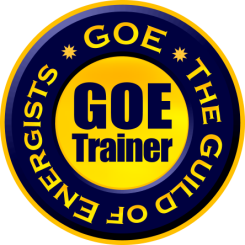 We recommend the new GOE EFT Foundation and Master Practitioner training which leads to an acknowledged certification as a Master Practitioner of EFT. This is a professional EFT Emotional Freedom Technique Foundation Training, giving proper instruction in modern EFT and how to do EFT with mastery and excellence. This new certification training in EFT allows you to add EFT to your practice insurance and confers full membership of the GOE. Emotional Freedom Techniques, or EFT (often known as Tapping or EFT Tapping), is a universal healing tool that can provide impressive results for physical, emotional, and performance issues. EFT operates on the premise that no matter what part of your life needs improvement, there are unresolved emotional issues in the way. Even for physical issues, chronic pain, or diagnosed conditions, it is common knowledge that any kind of emotional stress can impede the natural healing potential of the human body. In many cases, EFT can be applied directly to physical symptoms for relief without exploring any emotional contributors. However, for the most powerful, longest lasting results with EFT, we do expect to identify and target related emotional issues. The EFT premise also includes the understanding that the more unresolved emotional issues you can clear, the more peace and emotional freedom you will have in your life. Using EFT limiting beliefs can vanish, personal performance can soar, relationships can thrive, and vibrant physical health can be yours. If we’re being realistic, everyone on this planet has at least a few emotional issues holding them back. EFT can be an ongoing process that we use to clear out the old traumas, and welcome any new challenges with a healthy, productive attitude. We welcome anyone and everyone to use these tools for as much peace and freedom as they can imagine. This course is hands on and enables you to use emotional freedom techniques, for yourself family and friends, as a tool to resolve negative emotions such as anxiety, fears, anger, phobias, depression, shame issues, sleep, cravings and more. You will also be able to apply this holistic therapy to many physical symptoms as well. One Training – One Entire Year of Benefits! The Energy EFT Foundation contains a wealth of uplifting and inspiring exercises, tips and techniques and is the perfect course for Energy EFT beginners, or for professionals looking to learn the updated tapping method. This will be one day of practical tapping and Positive EFT. General public, mental health, therapists, health practitioners, counsellors, alternative medicine, holistic therapies, life coaches, reiki healers, personal development trainers, cognitive behavioural therapy, teachers. This course is also suitable for complementary therapists and health care workers wishing to learn and use powerful new approaches for working with clients independently and along-side most existing therapies. Tapping Techniques, you can put into practice to heal yourself and others. Lots of opportunity for practice, asking questions and having fun to help transform your life and the lives of your friends, and family. Skills about emotional freedom from negative or low energy states, creating high-energy states suitable for goal setting, inspiration, creativity and more. You’ll discover how to go from problems to solutions very quickly! This 4 day training is great for anyone looking to delve deeper into the EFT tapping process for both personal and professional use. Take your physical and emotional well-being to the next level with your very own hands, by simply tapping into your body’s own energy and healing power and watch yourself EVOLVE! Bridin has a broad base work background that has equipped her with a vast resource of experiences that are invaluable to her as a therapist, enabling greater understanding and effective progress in client’s therapy. After qualifying as a psychotherapist, Bridin further trained at The National Centre for Eating Disorders and Obesity in London and is an affiliate member of their professional network, holding specialist qualifications for working with anorexia, bulimia, binge eating disorder, obesity, eating disorders and associated mental health conditions. Bridin is the Managing Director and Founder of Northern Ireland’s first clinic treating obesity and eating disorders using evidence based psychological treatment models. Bridin is an Associate Trainer for The National Centre for Eating Disorders in London and an Associate trainer for BEAT Eating Disorder Charity delivering eating disorder training to professionals and organisations throughout Northern and Southern Ireland. She is a GoE approved Emotional Freedom Techniques Master Practitioner, trainer and facilitator. Bridin has also delivered Obesity Management training to the Health Promotion Team at Action Cancer. Bridin is a U.K.C.P Accredited Psychotherapist and holds professional memberships with www.ukcp.com www.awakenschool.co.uk and GOE.